Affordable excellent quality heavyweight 6.1 oz 100% cotton T-shirts custom printed in your choice of colors and styles! et of 15 softball uniform T-Shirts for your team! Excellent quality heavyweight 6.1 oz 100% cotton T-shirts in your choice of colors. 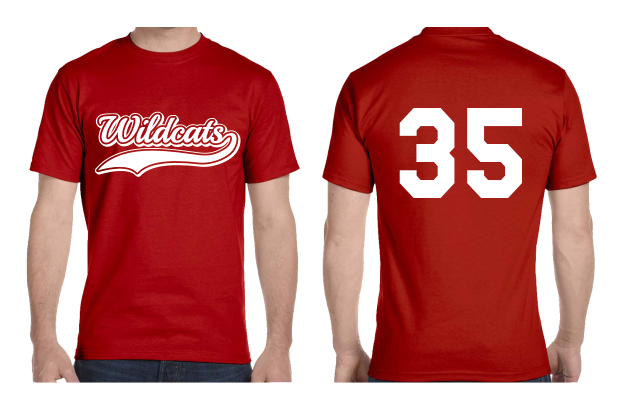 Printed with your team name and/or logo on front and individual numbers on back. Optional hats are $6.00 each. Softball T-Shirts can be any combination of sizes S, M, L, or XL. Sizes XXL and larger are available at an additional $2 each. Also available are Youth sizes S, M, L, and XL. Standard softball uniform T-shirt colors are your choice of red, royal blue, navy, sport gray, black, Carolina blue, light blue, purple, kelly green, forest green, lime green, gold, yellow, black, maroon, orange, or pink. Other colors are available as well, so your softball uniforms will be truly unique! Hats are available in black, royal blue, red, navy, silver gray, and white. (Other hat colors are available as well at a slightly higher price.) Print color is white for dark colored shirts, or any color you like on white or light colored shirts. You can choose from any of the print styles below, or if your team has a logo I can reproduce that as well. Have an idea for a design you'd like? Just let me know and I'll create it for you at no additional charge. Set of 15 printed softball uniform T-shirts is just $160 plus $15 shipping and handling. Additional softball uniform T-shirts ordered at the same time are $9.75 each (shipping included). For a pro sports team look, you can add individual names to the backs of your shirts for an additional $5 each. Not just for softball, these quality uniform T-shirts are also perfect for volleyball, flag football, basketball, and any other sports team. To order, please e-mail info@endangerous.com and specify shirt color, team name, print style desired, and list of shirt sizes with corresponding numbers. If you have a logo you'd like to use, please attach it to the email. A proof will be sent by e-mail for your approval prior to printing. No payment is required until the proof is approved. Your softball uniform T-shirts will be shipped via UPS right to your door.